Described as “one of the most slept on acts in music” by Hillydilly, Baby FuzZ released a litany of brilliant singles in 2018 and dropped a debut album Plastic Paradise in March. 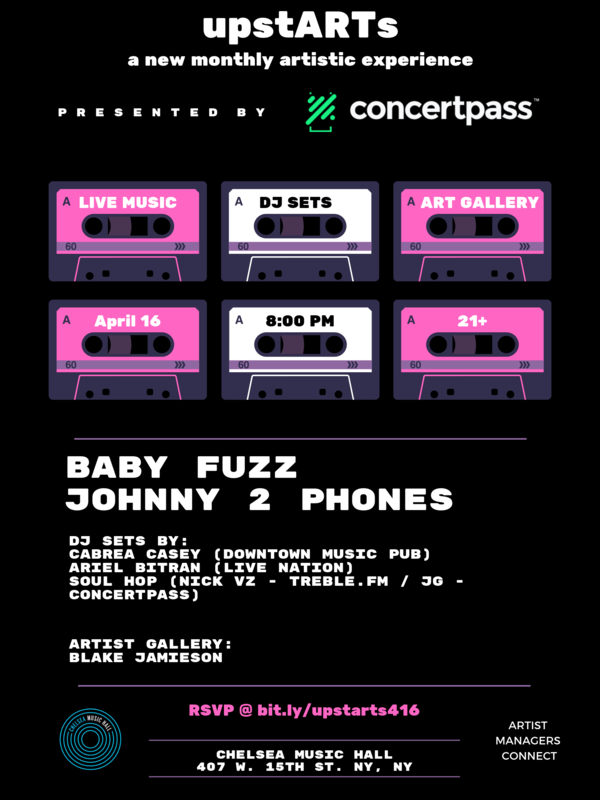 Baby FuzZ has also made a name as an enigmatic video artist, constructing some golden era MTV style music videos. Drawing comparisons to everyone from Billy Corgan to Elton John and Elliot Smith, it's hard to pin down exactly how to classify BF. In the past, Fox, the frontman of Baby FuzZ, produced “Video Games” by Lana Del Rey and has written for the likes of Madonna, Britney Spears, and Avicii, so there is a decidedly surreal pop sensibility to the weirdness. But with a charmingly punk ethos and a unique self produced album, Baby FuzZ just might be the strange new arrival the alt rock world needs. Johnny 2 Phones is a versatile artist who calls New York home. With sounds ranging from traditional hip-hop to genre-bending smooth songs and memorable hooks, Johnny is able to maintain a wide and engaged fan base, both online and live. Riz La Vie is an artist based in NYC who transcends genres. He has captivated his audience with his powerful imagery, raw lyricism, and a howling, soulful delivery. Patience, and the pursuance of high art as opposed to just the spotlight, is a theme that is of utmost importance in Riz's career, life and music. Since his debut, "found." in January of 2017, he continues to build an audience with an appetite: deeply analyzing his work and continuously packing out venues to watch a thrilling live performance. Keep a look out for Riz as he continues to build his following around the world. Blake Jamieson is a pop artist from San Francisco, California. His vibrant pop art portraits are inspired by street art. Jamieson has painted portraits for over 150 professional athletes and celebrities, including Antonio Brown (Pittsburgh Steelers), Joe Montana (San Francisco 49ers), Howie Mandel (America’s Got Talent), Rick Harrison (Pawn Stars), and more. Jamieson’s collectors span the globe, with works in the US, Canada, Mexico, Spain, Dubai, Australia, and the United Kingdom. Jamieson recently moved to Manhattan, NY, and set up a second art studio in Long Island City. In his NY studio, Jamieson hosts a monthly cocktail brunch and open studio. Email blake@blakejamieson.com if you’d like to be invited to the next event.